Complete website redesign and rebranding of an established company. 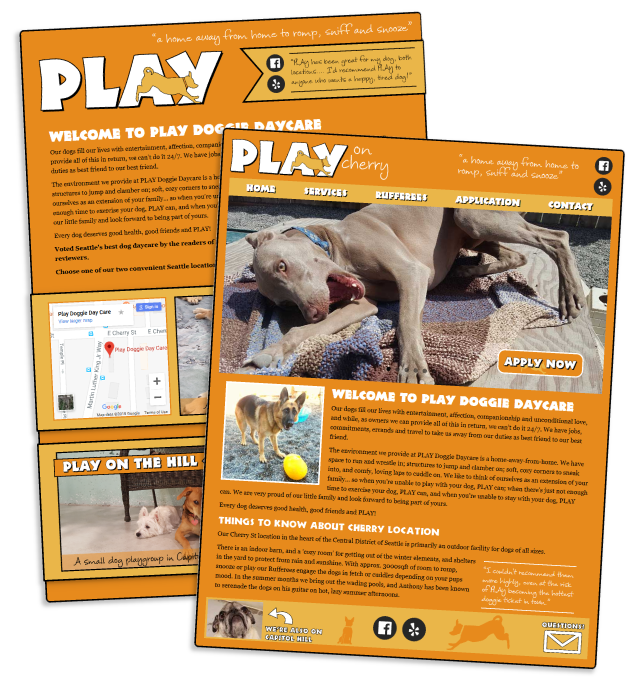 PLAY is a Seattle based dog daycare with two separate and unique locations. One of the main objectives was to highlight the two locations and make sure users understood which location they were applying to. Another was to vastly improve on that application form. They first thing I wanted to do was nail down the right mobile layout and information architecture, so I made a very quick prototype that I then used for field studies with potential users. It was time to really give this brand a new life. In addition to a logo redesign and increased social media presence, I gave a lot of thought to content strategy. My user research told me that potential clients wanted to feel confident knowing that this company would keep their loved ones safe and happy. I addressed that by making sure to give the brand a playful feel while also showcasing positive client reviews and employee backgrounds on the website. After working closely with my client to make sure they got what they wanted out of the redesign, I began development on the new website. I integrated SEO best practices through keyword research and usage, internal page linking, and careful wording of descriptions and tags. Because of this the website sits at the top of Google's search results despite being in a very saturated market. The company has seen a steady increase in web traffic since the deployment of the new site. Due to a clear distinction between locations and a much improved application form, analytics suggest an increase in successful client applications by nearly 100%.